Here’s something I know almost nothing about: Slugs. I found this slug in one of our prairies yesterday morning, and managed to get a few decent photos of it. Slugs are largely considered to be pests in gardens, but I’ve never heard any discussion of the ecological role(s) they might play in grasslands. 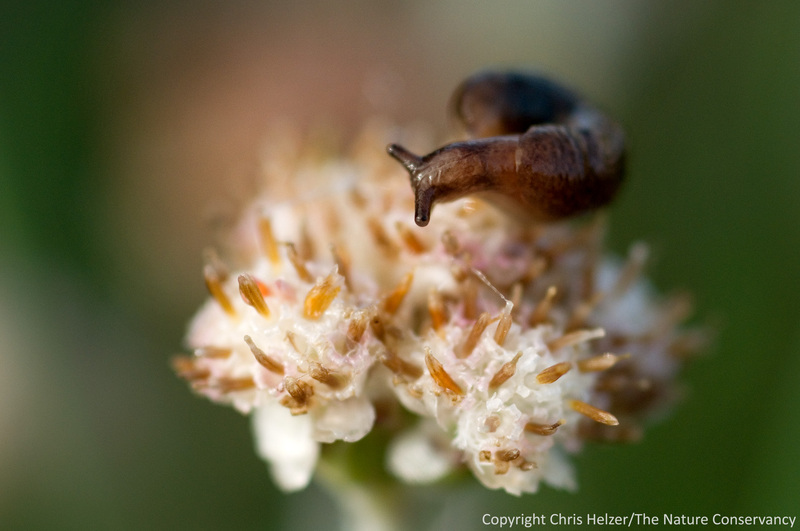 A slug on a pussytoes flower in the Platte River Prairies - Nebraska. What was it doing up there on the flower? Sure, I know that slugs are gastropods that resemble snails without shells. They have rasping mouthparts, eyes on tentacles, and leave trails of slime as they travel. But what do they actually DO in prairies? How important are they in the ecosystem functioning of a grassland? My understanding is that most slugs I see are probably introduced species, but are they causing any negative impacts in prairies? The best information I could find online was this field guide to the slugs of Kentucky. I thought it was great, but certain members of my family found it wildly amusing that someone had made a field guide for slugs. Those same family members seem largely uninterested in learning more about slugs, but I think they (slugs) are intriguing creatures, and would love to have someone feed me information on their ecological roles. This entry was posted in General, Prairie Insects, Prairie Natural History, Prairie Photography and tagged grassland, invertebrates, prairie, pussytoes, slugs by Chris Helzer. Bookmark the permalink. Love reading “The Prairie Ecologist”! Sounds like my kind of book! thanks for the tip. I know that slugs have a “saddle” that is properly called a mantle and the “fingerprint” in the mantle is a useful ID tool to a point. This: http://www.fnanaturesearch.org/index.php?option=com_naturesearch&task=view&id=1487&cid=186 might be a handy starting point. I’m with you on not knowing myuch about these, but thinking what can be knonw worth knowing. Field guides can generate interest, and I am glad to know of this one. I’d like to try it out on a few slugs form my yard. much, known, from – Always proof before submitting, especially when you’re as fumble-fingered a typist as I! Here in western Oregon slugs can have a pretty big impact on our grassland restoration projects in the establishment phase. They mow down seedlings and leave big patches of bare ground which eventually fill in with weeds. A number of research papers address the role of these mini herbivores in CA grasslands, but I’m not sure how relevant they are for the mid-west. I know that my snakes like to eat them. I over winter spinich and lettuce in a cold frame every year and when I see the slime trails on the clear lid early on in the spring and I keep an eye out for my snakes. Inevitably I find one in the box and I dont have any more problems with slugs eating my salad crop. I also know slugs like beer. It is a common way to control them. And the snakes will eat the slugs that are marinating in the beer!!!! I hope I am not contributing to the delinquency of my snakes:^)!!! Basically I think slugs are grazers. People in Califonia harvest snails and slugs and sell them to the local resturants!!!! So next time you see them…taste them!!!!:^)!!!! They might be yummie!!! And let me know what you find out! if they are good I will sell mine at the local farmers market this summer!!!!!! :^)!!! Karen – Market the slugs as “escargots sans coquille” and they’ll sell out fast! I love slugs! They are just so darn cute. I used to raise them and our land snails here. I need to start that up again. Thanks for the guide link. They can eat only small seeds, but actually increased germination of a couple of species.